Wildlife | Watching Mr Robin. I love watching birds through the window – a hobby which was passed down from my nan, which I think I’ve now passed on to Pugh. Trouble is, since I moved into a house with a teensy back yard I’ve struggled to think of ways to get them close. We have no room for a bird table, and our yard wall needs a bit of TLC before we can start to drill in holes to fit a bird house. 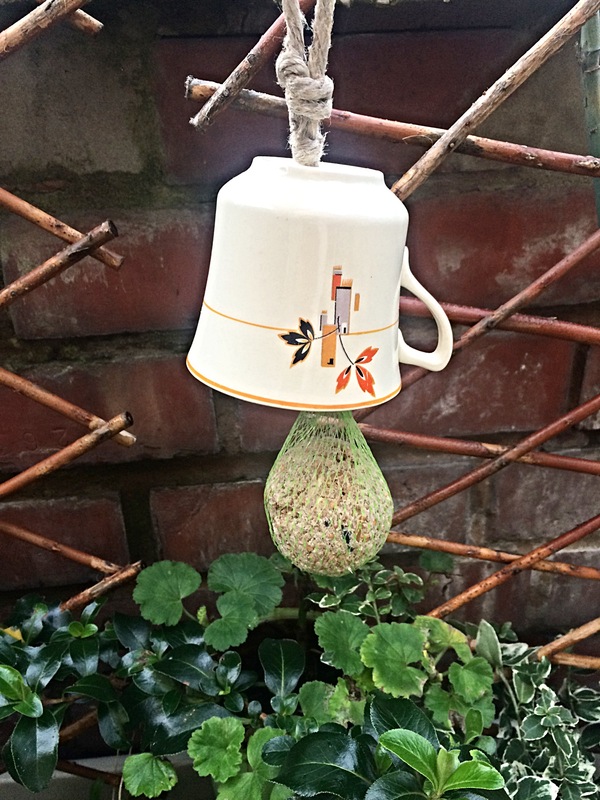 However For All We Know kindly offered to send me a (super cute) vintage repurposed teacup bird feeder to try out in my teensy little yard – and that, my friends, is how I’m going to get Mr Robin into my yard this winter! I haven’t seen him on the ball yet, but he’s inching his way in. Some days I see him on the wall. Other days on the washing line. He’s moving in – and when he does, I’ll be here to watch him. For All We Know specialise in beautiful homewares which are designed and made in Britain. Their range includes gorgeous art-inspired tableware, tea sets and the lovely bird feeders I’m talking about now. I had never heard of them before this feature, but I can assure you that I’ll be revisiting them. I love my things to have lots of character, and character oozes from their designs. Their focus on keeping it British is lovely, and they are totes anti-waste, repurposing odd teacups to create lovely and unique pieces. Aside from wanting just about everything they have designed to style my house, I think these feeders would be a wonderful gift for somebody into their gardening. The fat ball can easily be replaced so it’s great to give alongside extra fat balls, or perhaps with a fatball recipe card for the crafty gardener. ← A Lush Christmas | Hot Toddy, Rockin’ Reindeer & New Shampoo Bar.